BELIZE CITY, BELIZE, Tuesday, 19 March 2019 (CRFM)—The Caribbean Regional Fisheries Mechanism (CRFM) will convene the 17th Meeting of the Caribbean Fisheries Forum on 20-21 March 2019 at the Bird Rock Beach Hotel, Basseterre, St. Kitts and Nevis. Honourable Eugene Hamilton, Minister of Agriculture, Health, National Health Insurance, Human Settlements, Community Development, Gender Affairs, Social Services, Land and Cooperatives will deliver the feature address. Milton Haughton, Executive Director of the CRFM, and outgoing chair of the Forum, Alwyn Ponteen of the Fisheries Division in Montserrat, will also address the gathering. At the annual two-day meeting, heads of national fisheries authorities in CRFM Member States, and representatives from observer bodies and partner organisations will discuss the state of the region’s fisheries and aquaculture resources, challenges confronting the sector, interventions being led by the CRFM, as well as priority actions to promote blue growth and ensure sustainable use, conservation and management of the region’s fisheries resources and marine ecosystems. 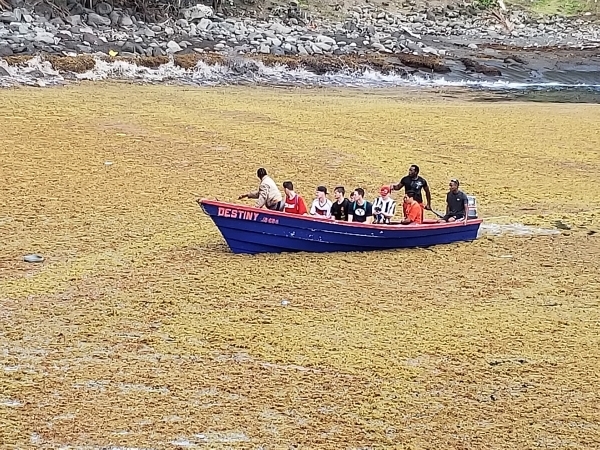 The CRFM Secretariat will provide an update on a recently concluded, regional study on the impacts of unprecedented Sargassum inundation on the Caribbean. The CRFM has noted that 2018 was a year of record high influx. There are ongoing concerns over the impact on fisheries, and the broader socio-economic and environmental impacts on coastal communities across our region. It is also expected that the Forum will agree on future plans for research and development, sustainable management and use of fisheries resources, sustainable development of aquaculture, and the adaptation to climate change and disaster risk management in fisheries. They will furthermore discuss capacity-building and institutional strengthening, and enhanced collaboration across Member States. The Caribbean Fisheries Forum, the technical arm of the CRFM, will be updated on the status of implementation of 2018 decisions of the Forum and Ministerial Council. It will subsequently outline a set of recommendations for action, to be tabled at the upcoming meeting of the Ministerial Council, due to be hosted in Basseterre, St. Kitts and Nevis in May 2019. The last meeting of the Forum was hosted in Montserrat, which has served as chair of the Forum for the past year. The leadership of the Forum will now be handed over to St. Kitts and Nevis for 2019-2020. A vice chair is also to be elected to help lead the Forum.